Posted on April 29, 2014 by Worth Stopping By . . . The BK has been travelling a lot lately, and I try to keep my pantry lean and mean when he’s gone. Unfortunately, when he returned from his latest adventure the cupboard was bare. There was nothing to do but call on my inner MacGyver. Cooking a frittata uses a bit of smoke and mirrors. This frittata is really nothing more than scrambled eggs and bacon with a little bit of something extra thrown in. It is a great chance to use up scraps of this and that and create a fantastic breakfast, brunch or quick supper. My daughter, Erin, introduced me to the idea of using mustard, either dry or prepared, when cooking with eggs. Just a little bit steps up the flavor without overpowering the palate. However, the scallions were the absolute star of this dish. There was a wonderful savory flavor that permeated every bite and left you wanting more hours later. 2. Cook bacon in a large skillet until almost crisp. Remove, drain and break into pieces; set aside. 3. Drain bacon grease, reserving 2 T. of drippings in skillet. Heat reserved bacon drippings over medium heat; add scallions and tomatoes. Cook until the tomatoes are softened. 4. Combine eggs, milk, mustard, salt & pepper; and whisk until blended. 5. Reduce heat under skillet to medium-low, and add the egg mixture, bacon and 3/4 c. cheddar. Stir until just mixed. 6. Cook until eggs are firm on the bottom, about 5 minutes. 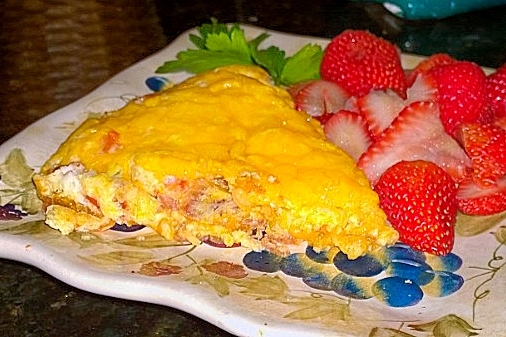 Top frittata with the remaining 1/4 c. shredded cheese, and place in preheated oven until cheese is melted and eggs are completely firm, about 10 minutes.